Feel like getting around quickly, but don’t want to spend oodles of cash on public transport? Don’t have much storage space in your home? Well, a Glion Dolly electric scooter may be right up your street. 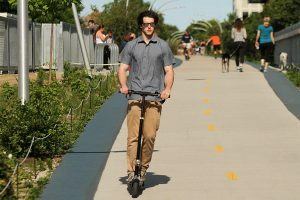 They are causing quite a stir at the moment, and this is because they are among the best foldable scooters on the market. The Glion Dolly is an excellent choice for people who are looking for a scooter for commuting. 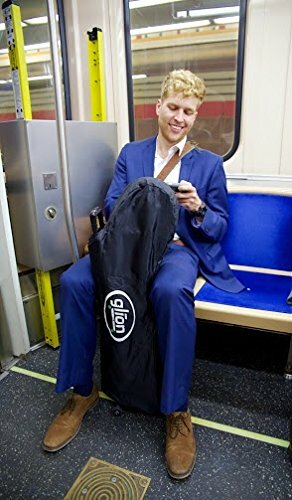 The portability and easy in carrying around is perfect for using it combined with trams and buses on your way to work or college. You will also be able to fold it and store in a matter of seconds by your office or school desk. I do want to point out, right off the bat, that a foldable electric scooter, even one as powerful as the Glion Dolly, is not going to be as powerful as your standard electric scooter. This is because these babies are designed to be folded up nice and neatly. They don’t have space for big, bulky motors or anything like that. However, I am going to talk more about the cons of the scooter shortly. Don’t worry, there aren’t very many of them. One of the reasons why I, personally, love the Glion Dolly folding scooter is because you have a multitude of different ways in which you can transport it about. With your standard folding scooter, you are probably going to have little choice but to carry it under your arm. This is just woefully annoying if you are going to be carrying the scooter for long periods of time. Even the lightest of scooters can feel heavy after a while. With the Glion Dolly, you can still do this. However, it also comes with a nice little handle that you can use to pull the scooter around like one of those hand luggage cases. This is great if you are planning to take your scooter on public transportation. It means that you won’t be swinging the scooter around in every direction hitting people, which I can’t imagine they will like that much. Bam. It is folded at ready to go. It takes seconds. Unfolding it takes around the same amount of time. Pull the handlebar and you are done. 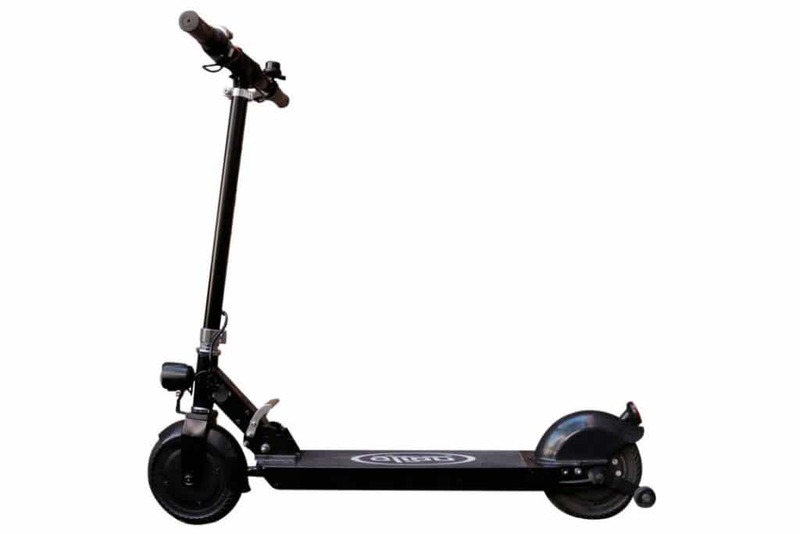 This means that the Glion Dolly scooter is perfect for those who are going to be riding their scooter and then hopping off regularly. Many people who have used this scooter often use it for their daily commute i.e. travelling between buses and trains. The Glion Dolly may seem big and bulky, but it is surprisingly easy to store. I don’t know how many of you have used portable scooters before, but the bulk of them have no stability to them. You try and stand them up on public transport and they are going to just fall down like a poorly constructed card tower. Not Glion Dolly. Even if you go over bumps in the road, the Glion Dolly is going to stand upright. It is also small enough that you can easily slide it into your cupboard or wherever when it is not in use. Sure, there is a bit more bulk in comparison to other foldable scooters because it functions as a ‘wheel transport’ scooter. However, even then, I don’t find it takes up that much space. 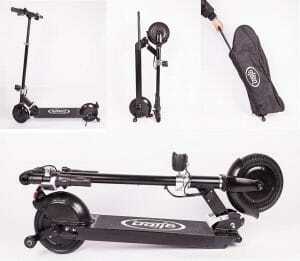 The only area where the Glion Dolly scooter loses some stability is when you are moving it over bumps on your own. Not so much when you are riding it, but when you are pulling it through the streets. Pull it over a bump and it will rock a little bit. You may even lose control of it. This is because the Glion Dolly has quite small wheels. Yeah, this is to help when it comes to storing it, but there would have been so much more stability if the company had added an inch or two to the dimensions of each wheel, although I have no doubt that this would have hampered its storage potential. The Glion Dolly electric scooter uses a rear brake. For the most part, it is of a high quality too. If you ride this, no matter the weather, you can expect the scooter to actually slow you down. I have never heard of a case where the brakes on this scooter have failed, although I have heard of cases where brakes have failed on other scooters on the market. However, you do need to be aware that having a brake at the back of the scooter does have its own problems. Perhaps the biggest is that it does slow down how quickly you can slow down. Granted the Glion Dolly is not an especially fast scooter (more on that in a short while), but if you are in an emergency, you do still want the ability to slow it down quickly. I can see that this may pose problems for people who are going to be weaving their scooter through areas which are packed with people. Nice stretches of road where you won’t need to stop in a hurry are fine for this scooter. What would have been nice to add is an emergency brake to the scooter, and maybe this is something which will be considered in the future. The wheels on the Glion Dolly have been built for flat surfaces only. While you could feasibly ride up small hills, if the slope is too steep, then you will likely be pushing the Glion Dolly to its max. It is not the fastest scooter at the best of times. It is going to be even slower going up steep hills…if it can manage at all. However, it does work well in rainy conditions. As I mentioned before; the brakes will not give up in the conditions you toss at them. Even when it is severely raining outside. You don’t have to worry about getting your ankles wet either. The fenders on the scooter will barely kick up any water, which is actually nice. There are far too many electric scooters on the market which have ended up with me getting soaked. The top speed for this Glion Dolly electric scooter is just 15mph, which is far slower than other electric scooters on the market. This is probably why I don’t find that many issues with slowing down quickly with this scooter. It is because it is never going to go fast enough that you won’t be able to slow down fast. To be honest, the bulk of people who are going to be using a scooter like this are not really going to be hitting the top speed anyway. Unlike cyclists, you won’t be able to ride on the road, which means that you are going to be having pedestrians get in your way almost constantly. You are probably going to be travelling slightly faster than walking pace. Therefore, I don’t see the lower top speed in comparison to other scooters as too much of a major problem. Remember; the scooter only has a 250w motor, so you are not going to be able to push it too far before it loses some of its power, particularly when it comes to travelling up hills. If you are going to be travelling up hills with any sort of frequency, then you will likely be looking for something that has a 500w motor instead. These are going to be a great deal costlier than the Glion Dolly electric scooter, so you are really going to need to weigh up whether it is actually worth it or not. You are going to be able to travel 15 miles before you need to charge the Glion Dolly electric scooter again. This is probably about average for this type of scooter. You must remember that it is slightly heavier than a few other scooters on the market, and the scooter needs to deal with your weight and its own weight. I can’t imagine that this is going to be a good electric scooter for covering huge distances each day. It is more for getting between public transportation, or maybe just for a short commute to work. Even when you are at work, you are probably going to want to charge it, even if the commuting distance is less than 15 miles total. This is because the scooter tends to lose its power slowly once the battery starts to go. Other scooters will give their all until the end, but there is a noticeable decrease in power output as the battery starts to dwindle. Also; as a note, the battery indicator on the scooter is not the most accurate in the world, so if it says that the battery is half charged, try to give it a full charge anyway if you are planning to be outside for long periods of time. It will ensure that you are not ‘caught short’ and need to carry the scooter home the rest of the way. That would sort of defeat the point of having an electric scooter in the first place. Thankfully, it does not take that long to charge, so don’t worry too much about that one. It is going to take a few hours at most, which is perfect for sticking on charge while you are at work. There is no suspension on the Glion Dolly electric scooter. This, once again, means that it is not really ideal for travelling on anything more than flat surfaces, and only up smaller hills. The smaller wheels on the scooter do make you realize that there is no proper suspension in place too. You can feel each and every bump that you go over. However, I can imagine that the bulk of people who are going to be riding this scooter are going to be doing it on flat surfaces in the middle of a town or city, so it is not going to be posing that much of a problem for them. The Glion Dolly weighs a rather hefty 28 pounds. However, it is nowhere near being one of the heaviest electric scooters on the market. Obviously, when you are riding the scooter, the weight is going to add a touch of stability to it. Although, the lack of suspension does nip this in the bud somewhat. When you are carrying the scooter, it barely feels like you are lugging around 28 pounds simply because it feels so well-balanced. I am not going to go as far as to say that the scooter feels ‘light as a feather’, but it does feel pretty nice to carry about and I don’t think many people will have issues with it. The only time that you really feel as if there is any weight to the electric scooter is when you are wheeling it behind you. I have no doubt that if you are pulling it behind you, you are going to be doing it one-handed, and it does feel like you are pulling something weighty and it can be tough to control. My suggestion is that if you are walking through a heavily crowded area, you should opt to carry it instead. It is just a touch too difficult to weave something that is this bulky around people. The Glion Dolly is for commuters only. There are far faster electric scooters on the market than this. However, when it comes to easy of transporting around when you aren’t riding it, then you are going to struggle to find something that comes even a little bit close to what the Glion Dolly is able to offer. Basically, if you are looking for something to get you to and from work, despite the shortfalls of the Glion Dolly electric scooter in some areas, you are seriously going to struggle to find something better than this.